How do the various batches of Aberlour A’bunadh compare? What about the annual releases of Port Ellen or Brora? How will my current (and discontinued) bottle of Laphroaig 15 year compare to the new 18 year? I’m having trouble warming up to Ledaig 10 year because of the nose. I wonder if that will change over time (but I won’t necessarily want to buy another 75oml bottle later to find out). There are plenty of reasons to store whisk(e)y samples for use/enjoyment at a later time. Maybe you have a large basement and plenty of space to store full size bottles. I don’t, and I’m not sure how much more kitchen cabinet space I can take up before my very understanding wife finally pushes back. Additionally, some would argue that it’s not a good idea to store whisky for an extended period in a bottle with lots of air in it (I’m curious to see what comes of this guy’s aging experiment). I wanted to start setting aside some scotch for later use, and ended up placing an order from Specialty Bottle in Seattle for 15 Clear Boston Round 4 oz bottles at $0.56 each, plus another $0.04 each for an upgrade to polyseal caps. The polyseal caps contain a cone-shaped insert that supposedly provides an extremely tight seal. They also have 2 oz bottles for $0.44 cents each($0.48 with polyseal caps). If you’re bottling samples to share with others, they also have shrink bands that you can cover the lid with (you shrink them with a hair dryer). The shrink bands are only sold in 250 count packs for $5 each. The 2 and 4 oz bottles use different size bands as well. If you know somebody that you intend to trade samples with, you could go in with them and split the cost. 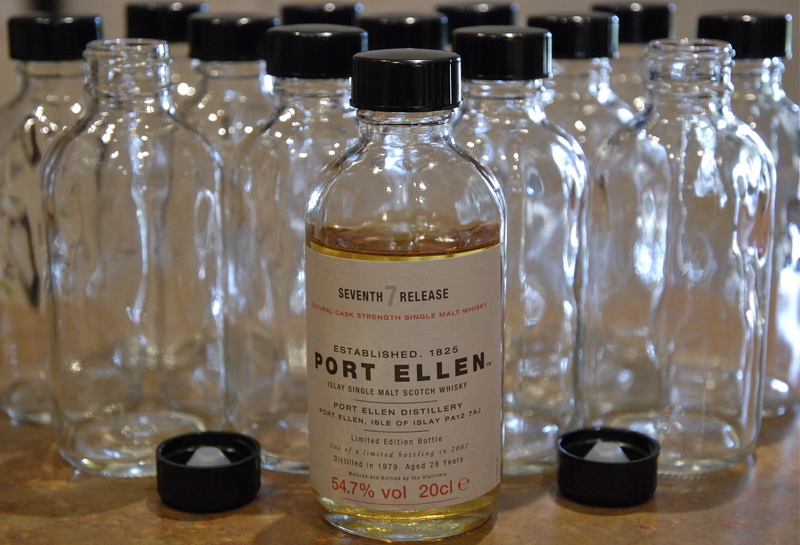 I used the first bottle to save 10cl of my Port Ellen 7th release (from a 20cl original bottle). I suppose I could have just kept it in the 20cl bottle, but I wanted to play it safe and cut down on the amount of air in the bottle (and seal it up tight). For the label, I used the original from the 20cl bottle. I put about an inch of water in a pot and brought it to a boil, stuck a screwdriver in the empty bottle and held onto the handle, and dangled the bottle over the steam for about 2 minutes. The label peeled right off, and had enough of the glue on it still to just stick it right on the boston round bottle. [Update 6/9/09] These bottles are great! I just bottled up some samples to exchange with another whisky fan here in town. We’re exchanging a combination of 2 and 3 oz samples. 2 oz (60ml) seems like a natural amount to exchange for a true “sample”, so I’m getting ready to place another order for some 2 oz bottles. I’m also going to order some shrink bands, as I’ll feel better about driving the samples around in a sealed bottle, should I happen to get pulled over or get in a fender-bender. If you have your own tips for storing whisky, I’d love to hear about it in the comments. Would you go with Amber or Blue bottles instead of clear? I like to be able to see the color of the whisky in the clear bottles, and any samples I’m storing will be in a dark place. Thanks for the information on the bottles. I found your site by doing a search for Whisky Sample bottles on Google. The bottles were just what I was looking for and the price was definitely right! Hi … hey thanks for putting up your post. I too came across this post while searching for whisky samples … and, for me too, these were the exact bottles I was looking for. Now … to somehow find folks in southeast Michigan (USA) with whom to trade samples. I haven’t tried wax sealing. http://www.masterofmalt.com/ seals their samples with wax…looks kind of like the Maker’s Mark wax. So far, I’ve felt pretty good about using the poly seal cap from Specialty Bottle (which I’m guessing is similar to the “phenolic cone lined caps” from the SKS site). Thanks! I got on SBottle and ordered some boston bottles with polyseal caps. Should be good.